The difference is in the details, like edging. Pioneer©, Spartan©, Newline©, SSS©, Johnson-Diversey©, Betco©, and more! Jobmaster started as a vinyl service business, with one truck over 25 years ago. 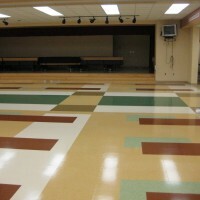 Whether its VCT, VAT, MCT, MFT, or any other acroynm of a vinyl floor, we can handle it. If its 50 sq ft or 500,000 sq ft, its well within our range. Though decreasing in more recent installations, vinyl and its other resilient counterparts still play a very important role in the floor covering world. There are a lot of advantages to having such a floor. 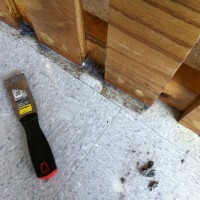 Vinyl floors last a long time, when properly cared for. Vinyl floors usually clean up to almost-new, regardless of the dirt level, if properly protected by finish. Their colors are vibrant and their uses are versatile. If you have a vinyl floor in need of service, give us a call or an email. We can help guide you on what is required to get them to the look you desire. There are steps that can be taken other than the expensive and time-consuming (as well as messy) process of floor stripping. When properly maintained on a schedule, floors can go years between stripping service, looking great the whole time. 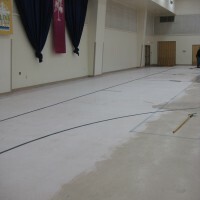 We have gone over 5 years without stripping a vinyl floor before, all because of a regular maintenance program.